Holders Australia cruised past New Zealand in their World Cup Group A tie. Mitchell Johnson (4-33) and Shaun Tait (3-35) helped reduce New Zealand to 73-6, before Nathan McCullum (52) led a recovery as the Kiwis made 206 all out. But openers Shane Watson (62) and Brad Haddin (55) put on a fine stand of 133 as the Aussies sailed home, winning by seven wickets with 16 overs to spare. Before the game there was a minute's silence held for the victims of Tuesday's earthquake in Christchurch. The Australians, who have won the last three World Cups, are now unbeaten in their last 31 games in the competition, a remarkable record stretching back to defeat against Pakistan at the 1999 tournament. The clinical nature of their victory in Nagpur will have sent a timely reminder to the other competing nations that Ricky Ponting's team, who crushed Zimbabwe in their opening match on Monday, are not about to give up their trophy lightly. 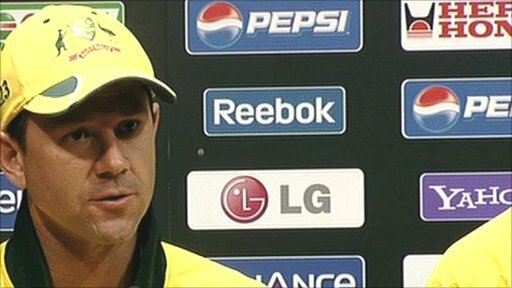 "You've got to be very, very happy with a result like that," said Ponting, aiming for his third successive World Cup win as captain. "For us to turn up today and win like we did is really satisfying. We pretty much put them out of the game early. "We said right at the start of the tournament, if our fast bowlers bowl as well as they can, it can't matter who we play." Ponting won the toss and put New Zealand in to bat at the Vidarbha Cricket Association Ground after both teams and the spectators had immaculately observed a minute's silence in memory of the 113 people who died in Tuesday's tragedy in Christchurch. Kiwis physio Dayle Shackel and trainer Bryan Stronach have both gone home to help their families in the aftermath of the disaster, with all the players deciding to stay with the squad. Skipper Daniel Vettori said he hoped they could bring some cheer to the people in New Zealand, but his side soon found themselves in all sorts of bother as Australia's pacemen accounted for the top order. Openers Brendon McCullum and Martin Guptill, who took 19 balls to get off the mark, were both out inside the first powerplay with only 40 on the board, before Johnson had both Jessie Ryder (25) and James Franklin (0) caught behind by Haddin. When Scott Styris edged Tait behind for a duck and then the fast bowler cleaned up Ross Taylor, New Zealand were on the brink of complete humiliation at 73-6. Jamie How and Nathan McCullum led a recovery of sorts as they put on 48 before How fell lbw to Steve Smith for 22, and then McCullum brought up a half century off 72 balls as he added another 54 in tandem with Vettori before Johnson trapped McCullum in front. Vettori used the batting powerplay to carve some late runs in an entertaining 44 from 43 balls, but their total of 206 from 45.1 overs never looked anything like being enough to cause the holders problems in their run chase. Indeed, Haddin and Watson produced a batting masterclass to take complete control of the contest, capitalising on some wayward bowling and flaying the Kiwis to all parts of the ground as they put on 133 from 18.1 overs. Haddin made a flying start, using the review system to overturn a decision after he had been given out lbw and going on to hammer eight fours as he brought up his 12th ODI half-century from only 39 balls. Watson began in more circumspect fashion but played some fearsome front-foot drives and pulls once he got going, bludgeoning a six off Nathan McCullum and bringing up his 21st fifty in the format from 52 balls by carving Vettori through the offside for four. New Zealand gave themselves a glimmer of hope when Haddin wafted a slow Hamish Bennett bouncer in the air to Franklin at mid-wicket and three balls later Watson miscued a drive off the same bowler to send the ball crashing back into his stumps. Captain Ponting, who was reprimanded for damaging a TV set in the dressing-room after being run out against Zimbabwe, was magnificently stumped down the leg side by Brendon McCullum off the bowling of Tim Southee for 12, but Michael Clarke (24 not out) and Cameron White (22 not out) guided Australia home with the minimum of fuss. The only downside for the Aussies, who now face Sri Lanka in Colombo on Saturday 5 March, was the news that fast bowler Doug Bollinger's World Cup had ended before it had even begun, the 29-year-old ruled out of the competition with an ankle injury. 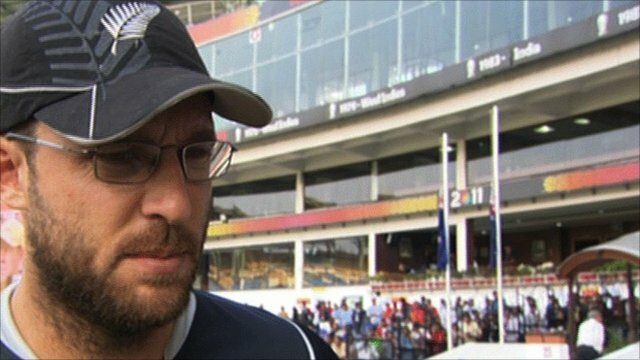 New Zealand will now aim to get their campaign back on track against Zimbabwe in Ahmedabad on Friday 4 March, with Vettori urging his players to put the disappointment of such a heavy defeat behind them. "It was a disappointing performance with the bat. We got bowled out for 206, which was always not going to be enough against a team like Australia," said the Kiwi captain. "We have to move past this quickly and play well against Zimbabwe in a few days. There are always areas to improve - the fielding was outstanding, but the bowlers need to back it up."